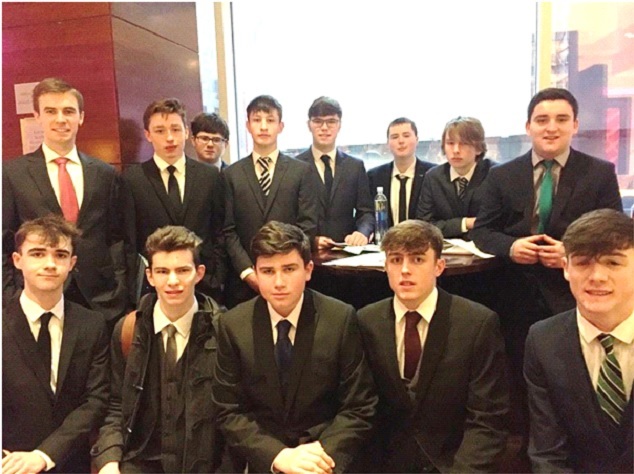 World Championship Mock Trial finalists at the Eastern District Court New York City included are: l to R: Mr. Conor Mc Guigan Law Team Coach, students: Ronan Boyle, Eddie Mc Kenna, Cillian Sherry, James Rose, Ronan Gallagher, Oisin Mc Elroy, Shane Mc Cluskey. Front row: Jake Bond, Niall Crawley, John Lowry, Thomas Croarkin, Patrick Mc Carron. Saint Macartan’s College Law Team and All Ireland Mock Trial Champions 2016, under the direction of the school’s Law Team coach, Mr. Conor Mc Guigan recently participated in the prestigious ‘Empire Mock Trial World Championship 2016’ in New York. Over 50 teams from the United States, Australia, Canada, Ireland the United Kingdom, Hong Kong and South Korea participated in the competition, which is now in its tenth season. This year’s event was held in the United States District Court of the Eastern District of New York. 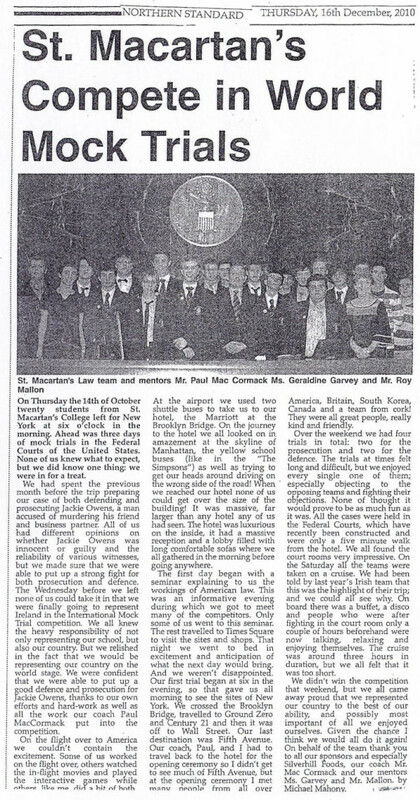 During this Global competition and following many months of preparation, the Law Team from St. Macartan’s College participated in four intense mock trial rounds against teams from South Korea, Hong Kong and America. Applying their knowledge of the American legal system and using their critical thinking skills, allowed the students to produce high quality performances in each round of the competition. Demonstrating their analytical reasoning and successfully arguing a highly complex legal fact, the students from St. Macartan’s College successfully defeated a South Korean Team in the first round of the competition commencing what was a strong performance from the All- Ireland winning team for the duration of the competition. Although the team was narrowly defeated in the final two rounds by a couple of points, it was clearly evident that the boys were comparatively competent to their peers and were unfortunate not to come home with a title, this time. As part of the Law team’s preparation for this event, many fundraising initiatives took place throughout the summer months. We sincerely thank all those who supported these fundraising initiatives.